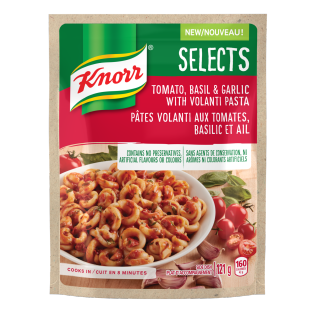 Quick and easy to prepare, Knorr Selects pasta sides are made with fewer and more wholesome ingredients. They're great as part of a delicious main meal or as a standalone side dish. Wheat Volanti Pasta, Dried Vegetables (Tomato, Garlic, Onion), Parmesan and Romano Cheeses (Dehydrated), Salt, Corn Starch, Olive Oil, Yeast Extract, Herbs, Natural Flavour (Soy), Sodium Phosphate, Spice. 1. Put 1 3/4 cups water and 1 Tbsp. olive oil into a medium saucepan and bring to a boil. 2. Pour your Knorr SelectsTM into the saucepan. Give it a stir. Bring to a full boil, then lower the heat to medium-high and boil 8 minutes, stirring frequently, then constantly in the last minute of cook time (this will help avoid sticking). 3. Turn off the heat and wait 2 minutes for the sauce to thicken. Stir once more and enjoy!